Instagram is an outlet for countless different types of accounts, some of which include fashion, comedy, travel, company promotion, and personal lives. At the high risk of being labeled as a basic girl in her 20s, my favorite type of Instagram account to follow would have to be the foodies. 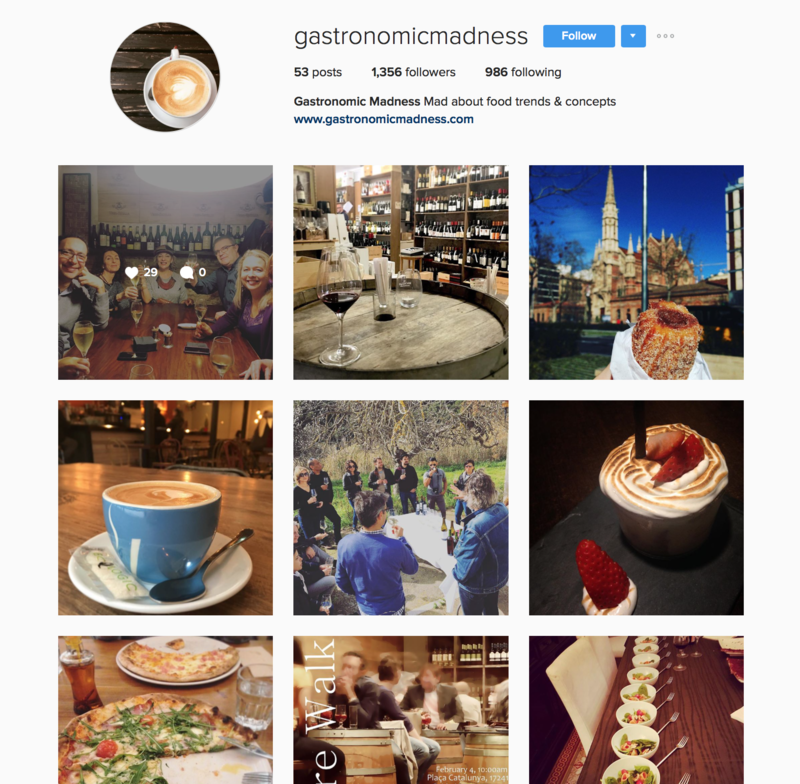 “Foodies” are people who are passionate about food and finding the best eats to snap a pic and share with their eager followers. They will never fail to post photos of the most delicious and unique dishes they can find, and people go crazy for it. 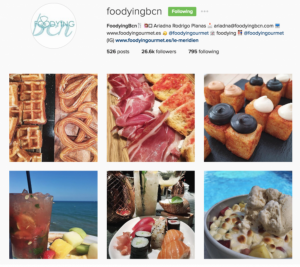 This is a list I’ve put together of some of my favorite and most popular foodie accounts based right here in Barcelona! This account is run by a woman named Maria from Finland who has been living in Barcelona for eight years. She has an impressive 32.4k followers on Instagram, as well as a popular food and travel blog. Maria posts beautiful photos of food from her favorite places to eat in the city, and she always includes the location tag so you can find them yourself if you’d like! Check out her blog here. People must be passionate about food in Scandinavia because this next account is run by a woman originally from Sweden! She is based in Barcelona but also shares new and old favorites from Sweden and other places around the world. The photos are filled with color and are usually fresh and natural dishes that will make you wonder how you could crave something so healthy. Find all this and much more on her blog here. 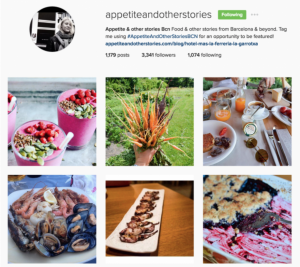 I love this account because it focuses on the art and aesthetic of food, as well as discovering new “hotspots” and writing about the experiences that happen around the table. The posts are mostly in Spanish, but they are not too difficult to understand, even for non-Spanish speakers. Anyway, a picture is worth a thousand words, right? 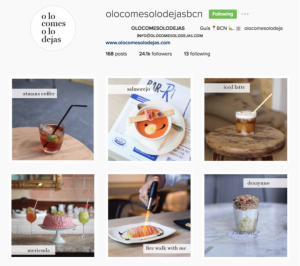 In addition to Barcelona, their dynamic and easy-to-navigate blog also includes articles and photos from Madrid, Alicante, and New York City! 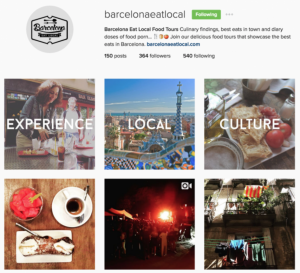 This is the official account of Barcelona Eat Local Food Tours, a company that provides a way for people who are passionate about food to get to know Barcelona’s gastronomy through the eyes of the locals. The tour takes you away from the touristy hotspots and delves into the more authentic food of Barcelona that your taste buds will thank you for. Follow their Instagram for secrets on how to eat like a local, and visit their website for more information or to buy tickets! My favorite part of this account that caught my attention is that the photos are all taken up close to the food rather than showing the entire presentation. This unique twist on the page run by a woman named Ariadna allows the viewer to focus in on every mouth-watering detail of whatever dish is being featured. If you’re finally able to peel your eyes away from the food, the captions are filled with fun emojis used in the descriptions that give helpful recommendations about the restaurant. If you have a taste for the more luxurious foods in the city, @bcngourmet is an account right up your alley. It features gourmet dishes from some of the fanciest restaurants in Barcelona. I realized these photos use the same zoomed-in style as the last account, and after a little more research I found out that (plot twist!) the man behind @bcngourmet, Miguel, is married to Ariadna from @foodyingbcn. Are they the Foodie Power Couple of Instagram? Check out their combined blog to find out! 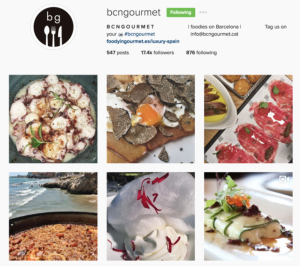 Barcelona has no shortage of good food, and certainly, no shortage of good foodie Instagram accounts to prove it! 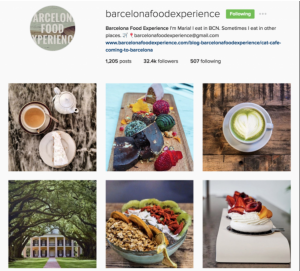 Whatever city you’re spending time in, you can use Instagram as a tool to find the best and most delicious places to eat. If you have a passion for food and a smartphone, you can join in the network of foodies yourself! Pick a theme, create an account, and share your favorite eats with the world. There is no such thing as too much food on the Internet.